I’m so totally stoked about this beta. I have spent a couple hours poking around, and I can say that this beta is further along than I expected. I have high hopes that this will in time replace Indesign for us (a small publisher), and it looks well on track. While you're there: being able to save the searches as presets would be ideal. And as not everyone is familiar with GREP, a few pre-saved searches would help provide them immediate use: remove multiple spaces, remove trailing space, etc. Same here - I'm trying out this new soft, and so far GREP is the only one thing that I miss. Situation is quite similiar for publishing in polish. You have to put non breaking space on some stand alone characters, so they will be pushed into the new line. Would love to see this feature in Publisher :). Yup, regular expressions search and replace is very, very useful feature - I would also like to have it available. InDesign has the ability to add character-level styles to strings/patterns in paragraph styles, which is an extremely powerful and time-saving function. I would love to see this implemented in Publisher. Beta looks great so far! I have merged your post into this existing similar suggestion thread, hope that is OK.
Can I add my voice to the need for good GREP with customisable presets. I estimate the GREP presets in ID save me at least an hour per day. I couldn't use an app that didn't have this facility. Definitely find/replace with GREP is must have for me to work with i.e. books. I can't even imagine to typeset 400 or 500 pages without this feature. It is like ten years step back for me comparing to InDesign (I still use CS6 but GREP works great is is real lifesaver). Please, make GREP one of your priorities... or add an option in paragraph composer for removing "orphans." Great thanks for the Beta. both in Search/Replace criteria and Styles definition. Same here. I add my voice to those demands. No I am not part of the development team, but as this thread is already so popular I will pin it for visibility. [...] but as this thread is already so popular I will pin it for visibility. Happy about that. Count me as a +1 for GREP support - in Styles as well as Find/Change. First of all thank you for this amazing first beta. I will definitly consider buying it. What about Search & Replace with Grep and Grep-Styles? A workflow without of that is nowadays hard to imagine for me. I've been looking for a way to automate publisher by scripts or actions and maybe i've been overlooking it, if not will there be somesometing in the future and, if so, in which language would these scripts need to be? Yeah, i know its a beta, but can you guys tell me something about an exchange format like idml? Is there something in the pipeline? To use Publisher productive i would need to extract all text for translation systems. I would like to add my strong +1 to get this feature added to Affinity Publisher. This is especially useful with character styles as seen in inDesign. I completely agree with the quote above by gaspar_schott. I use this feature all the time and it's just great and an incredible a time saver. In fact the problems shown above in the Polish and the Czech language could be solved by one grep rule in the paragraph style. Defo needs GREP it was an amazign feature add to InDesign. And I'm pretty good with GREP so could help people out on the forums when it comes in! A short correction to my previous post. 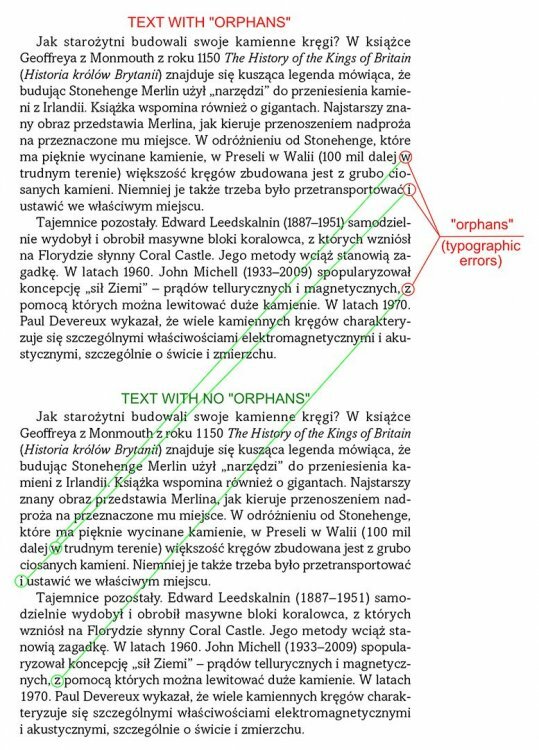 What was called an "orphan" in it is more often called "wiszący spójnik" ("hanging conjunction") in Polish. The "Orphan" is a more official term and "hanging conjunction" is more colloquial. The typographic problem of "hanging conjunctions" doesn't exist in most languages, including English, because a single letter or digit at the end of the line is irrelevant in them. As I see it, an "orphan" is the first line of a paragraph at the bottom of the column or page in Publisher, so please do not confuse these two different typesetting errors. Forget about my request for supporting Hunspell, because I have found that Publisher supports it and it works well. Thank you for clarifying, as I thought you were talking about something else. Widows and orphans in English refer to single lines at the start or end of a page that are separated from the rest of their paragraph. The issue you describe is relevant in other languages as well. French is what I work with, and although it does not matter for words, it does matter with numerous punctuation marks, as there is a space that separates the punctuation mark from the word it precedes or follows. Inserting nonbreaking spaces is the solution. This thread is about GREP, and indeed it is a useful tool in taking care of the situation. I just downloaded Publisher beta and reproduced a couple of InDesign CS6 files containing tables. So far I love Publisher. You have done an amazing work at making it much more intuitive than InDesign. The first thing I missed though was GREP (find) and GREP styles. These are essential if you are designing a book, brochure of manual. In agreement with everyone in this thread, please add GREP to Publisher. Looking forward to replace InDesign.